Miners Candle condos for sale are located at about 3 o’clock on the loop called Columbine Drive in the Four Seasons section of the Warriors Mark neighborhood. The base of Peak 9 of the Breckenridge Ski Resort and the Quicksilver Lift is easily within walking distance, but the free town shuttle, also stops just outside the door. Either way, these homes are close to the center of Breckenridge. Warriors Mark, where Miners Candle is located, was annexed into the town of Breckenridge in the last decade, and so enjoys voting rights, cheaper utilites and rec center fees and this shuttle. Shops, groceries and recreation are easily accessible from any condo for sale in Miners Candle. Explore active Miners Candle condominium listings below, or read more about living in Miners Candle. Maintained trails make it easy to get through the center of the Columbine Loop, over to the base of Peak 9. In the summer, the trails on the ski mountain are just as easy to access via footbridges over the Blue River. And fishing is permitted on this part of the river. Miners Candle Condos are modest, 2-bedroom homes in a small complex with plenty of off-street parking. 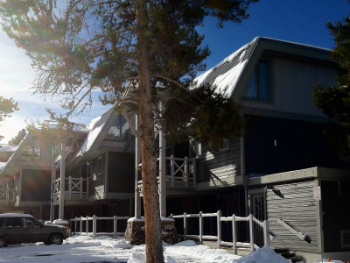 They have easy access to Hwy 9, and are a very short walk – only a block or two – from the center of Breckenridge. 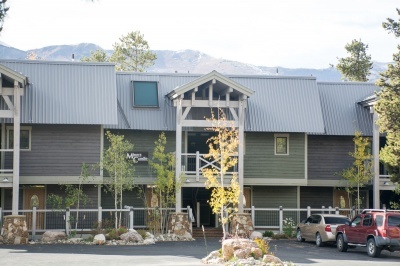 These condos have views toward the Tenmile Range, although upper units will have a more open view, one that is less screened by the surrounding trees that have been preserved in this neighborhood. Size: 786 to 886 sq. ft. Located at 106 Broken Lance in Warriors Mark, across the Blue River from the base of Peak 9, on the inner circle of the Columbine Loop, just south of the Columbine neighborhood pool. Drive south on Main Street to last stoplight at Boreas Pass Road, turn right on Broken Lance Drive. At the three-way the parking area for Miners Candle will be immediately ahead. Miners Candle Condos are located between Lances West and The Lift. Do you have any questions about the local Breckenridge real estate market? Contact us today to get your questions answered!